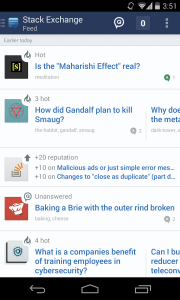 Stack Exchange for Android is here! Stack Exchange for Android is here! Stack Exchange for Android is here! Stack Exchange is a group of thematic question-and-answer webs. Each site is a community specialized in a specific topic, where a user asks something and the rest can offer an answer. The responses are measured in terms of quality, so users acquire a reputation depending on the positive and negative ratings that the community gives to their contributions. Currently there are over 120 communities within Stack Exchange, covering topics as diverse as programming, games, traveling and literature. However, until now, it was only available on the Internet; there wasn’t an app for mobile devices. The great news is that a few days ago, an app version for Android was launched. This app joins all the websites under a single interface, featuring a unified style that fits the Android style. We can sign in using the Google+, Facebook or Stack Exchange account, but we can also navigate without signing in if we don’t want to make or answer any question. The Feed adapts to your activity, showing more questions from the site you participate more often. And you will receive updates from all the sites you have visited. Stack Exchange is available only for Android. The company has announced the launch of the iOS version in the coming weeks, followed by a tablets’s version among others.